Home Sailing Culture Cruisers’ stories: Can you afford to sail? Cruisers’ stories: Can you afford to sail? Being a cruiser and living on board 24/7 has the stigma of being expensive and, therefore, many feel they cannot experience this lifestyle. 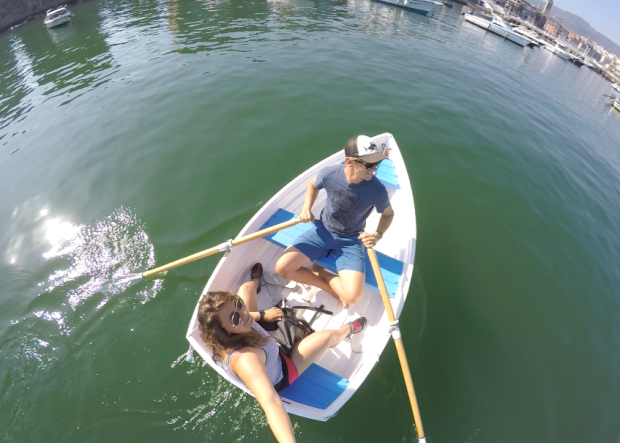 Yet, Ryan and Elena of Sailing Kittiwake are living proof that sailing is, in fact, also doable for people with a smaller budget. 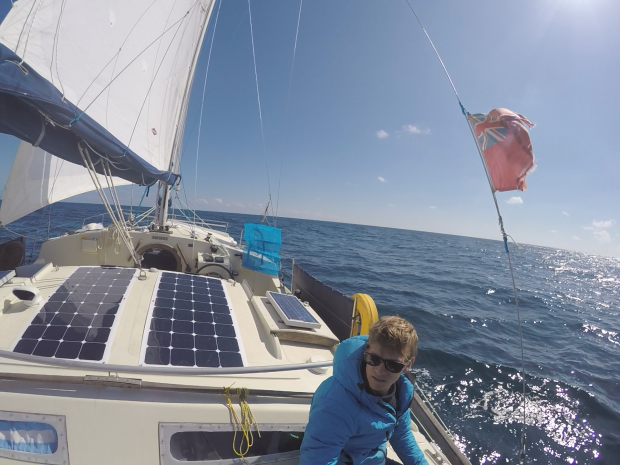 In their first guest blog for Zizoo, they tell us how they get along on a sailing budget of only €500 a month. So if you ever wondered, “can I afford to sail?”, read about how to live the cruiser’s life on a limited budget. The cost of cruising: Can you afford to sail? Before we took the plunge into becoming full-time live aboard sail cruisers, one of the many questions we asked ourselves was ‘how much money will we need to go sail cruising? Googling this question was maybe naïve, but of course, it was something we did. 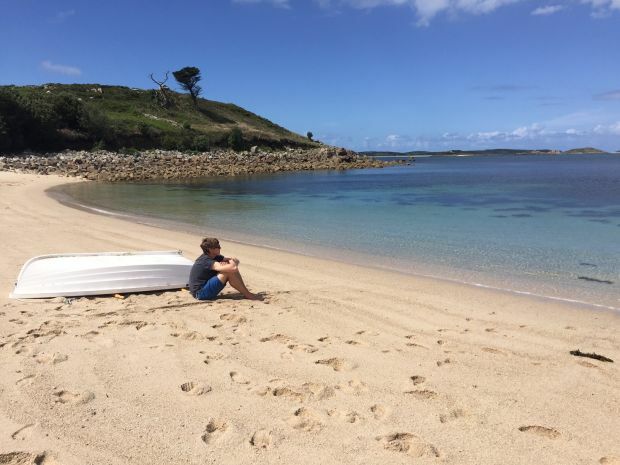 We came across countless forum threads along the lines of ‘please help, I don’t know if I have enough money, my budget for a boat is €200,000, will I be able to afford a new 50ft Catamaran with air conditioning and five bedrooms?’ These threads were of little use to us in answering our own questions. Reading them, one might think you need to be rich to be able to cruise. However, that’s not true at all. Just like on land, the cruising lifestyle can vary a lot. There are cruisers who want a big fancy boat, eat out most nights, sail from marina to marina, visit many attractions and essentially life as they were on holiday full-time. These people can spend up to €6,000 a month. Other sailors spend €2,000 a month cruising on a big boat but living a bit more frugally. Around €1,000 is usually a popular budget for the cost-conscious cruisers on smaller yachts who occasionally stay in marinas. In reality, you can go cruising on even less. We sail our dinghy which reduces our fuel bill. Boat choice will influence the cost of cruising massively. Keeping a beautiful old wooden yacht in perfect condition will cost a huge amount in maintenance (not all of us are as handy as Larry Pardey…). And the bigger the boat, the more expensive everything is – marinas or moorings, hauling out fees, maintenance and insurances. The biggest mistake cruisers can make is to buy a boat that’s too big for their budget. These people sadly end up bankrupt, as they spend all their money fixing and maintaining the boat. Therefore, we bought a seaworthy rugged old boat in good shape and fitted her out with super simple systems like manual water pumps and a composting toilet. Our boat is a 26ft catamaran and has one bedroom. This might sound a little spartan for some, but for us, she’s a perfect floating home. And our choice of boat is 99% of the reason why we can cruise on a modest amount of money. Our simple beauty which allows us to afford the cruising life. But just what is a modest amount of money to cruise with? Well, we have no completely fixed budget, but we have what we refer to as our ‘base budget’. This base budget is €500 a month and is about the minimum we can get away with spending. But as we are earning money on the along the way, if we earn €1,000 in a month and we want something extra for the boat, or fancy going out for dinner then we will go over our €500. We have a small, simple boat (as discussed above) that we can maintain ourselves. We do all maintenance and repair ourselves, avoiding costly marine professionals. 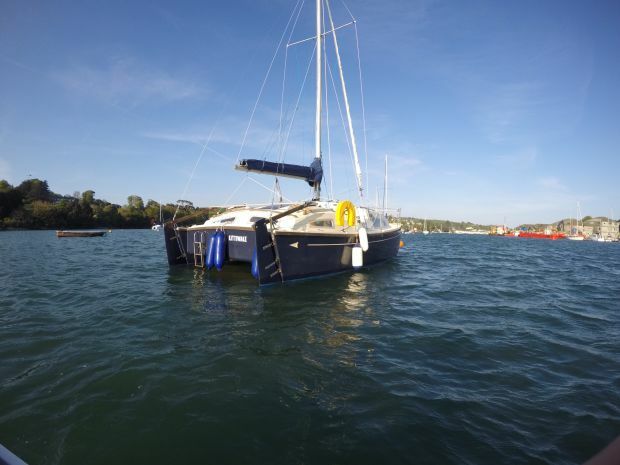 We have a good oversized anchor and trust it, so we never spend money on marinas. In fact, we haven’t stayed in a marina yet, although we do occasionally use mooring balls if there’s no safe or comfortable anchorage nearby. We don’t eat out much. Having dinner on the deck of the boat in a beautiful anchorage is luxury enough, but if we really fancy not cooking, then we grab a takeaway pizza and have it on the quayside. We use our sails as much as we can so we can avoid spending a lot of money on fuel and engine maintenance. We try to sail whenever we can in order to save money on fuel. In reality, our monthly spend varies massively. Things crop up that you couldn’t foresee. For example, yesterday we lost our favourite fishing line overboard, so we’re going to spend more money on fishing gear this month. And last week we stocked up engine servicing parts, but as we’ve made a little extra money this month, it’s fine. The fact that we divide our budget this way, does not mean that this is also the right budget for you. You may want to stay in marinas every now and then to have easy access to amenities, or you may want to go out for dinner once a week as a date night. Just make sure you account for these expenses in your budget so you can match up your savings and earnings with your necessities. We keep track of how we’re doing by occasionally totting up the money in our bank accounts and dividing it by our expected monthly expenditure. This tells us how many months we have before we need to worry, and at the moment the sum is nice and healthy, so we can rest easy. A great way to control your spending is to note down all your expenses on a spreadsheet. This way you’ll be able to check back and see what’s costing more than expected and where you should try to cut back. We’ve found that it’s all about being flexible – if you need to make a big purchase or your insurance is up for renewal, then just east a bit cheaper or go without that trip to the restaurant. These little sacrifices are easily worth it for a way of life that is rewarding and enjoyable. We have slotted quite easily into this new way of life and budget. Before we left the land, our monthly food spend was about the same and we rarely went out to restaurants, preferring to eat in together most of the time. Once you decide to become a cruiser, your way of life will not rapidly change overnight. Think about what your habits and preferences are when living on land. If your food budget is high and you’re used to eating out a lot and going out to bars or attractions, then you might not enjoy a frugal life aboard. But the trap a lot of cruisers fall into is set off with a modest budget and wanting to live a luxury lifestyle. Obviously, this isn’t sustainable and most will head home when their savings are burnt up. The key to making it a permanent way of life is to make sure that you can afford it indefinitely. But in the end – no matter your budget, the view is the same for all. Now that you know how to organise your sailing budget, it is time to try out the lifestyle of a cruiser! Check out Zizoo’s latest boat holiday discounts to find sailboats for as little as €150 per day.